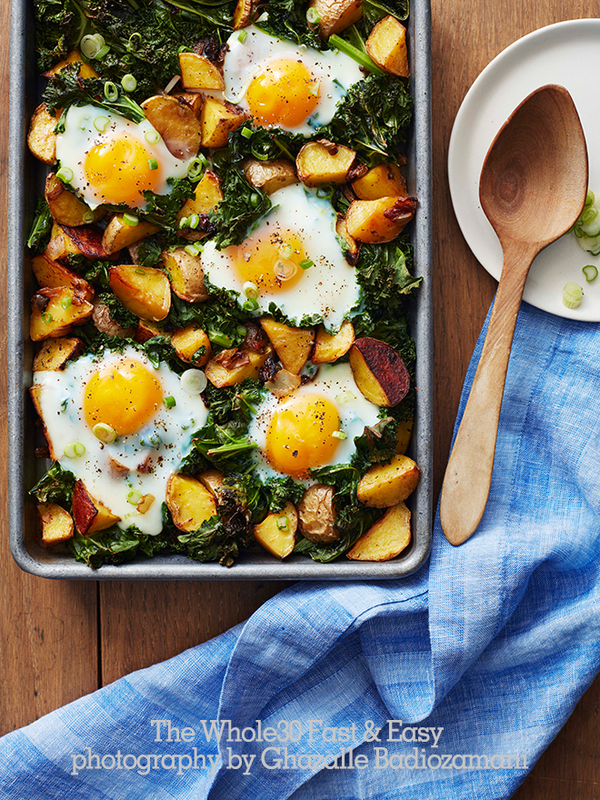 The Whole30 Fast & Easy Cookbook is available everywhere NEXT WEEK on December 5, and today we’re giving you a preview of a dish that will work for your Whole30 breakfast OR dinner: Roasted Potato and Kale Hash with Eggs. Want even more recipes from The Whole30 Fast & Easy Cookbook? We’ll send you 5 recipes from the book as a pre-order bonus! Just forward your receipt from any retailer to [email protected] We’ll verify your purchase and send you information on how to access your bonus content! 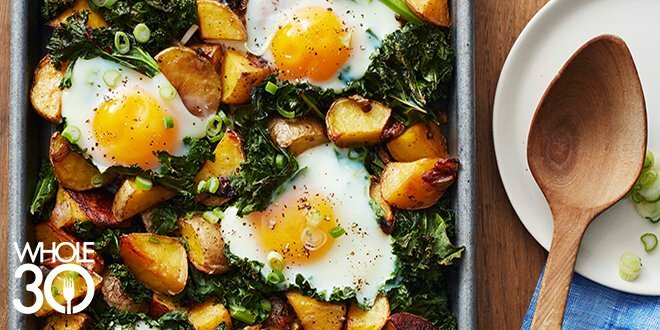 The creaminess of the roasted potatoes nicely balances the hearty texture of the kale in this sheet-pan hash. Using pre-chopped kale saves the time of washing, stripping, and chopping the greens. PLACE a rack in the center of the oven. Preheat the oven to 450°F. Line a large rimmed baking pan with parchment paper. COMBINE the potatoes, onion, garlic, olive oil, oregano, chili powder, salt, and black pepper in a large bowl and toss to coat. Spread on the baking pan. Roast until the potatoes are just tender and starting to brown, about 20 minutes. REDUCE the oven temperature to 400°F. Add the kale to the pan and stir until the kale wilts, returning the pan to the oven for a few minutes if necessary. Make six indentations in the hash and carefully break an egg into each indentation. Roast until the egg whites are set, 8 to 10 minutes more. Top with the green onions, sprinkle with chopped parsley if desired, and serve. TIP Look for washed and chopped kale near the packaged lettuce in the produce aisle of the supermarket. Excerpted from The Whole30 Fast & Easy. Copyright © 2017 by Melissa Hartwig. Used by permission of Houghton Mifflin Harcourt. All rights reserved.